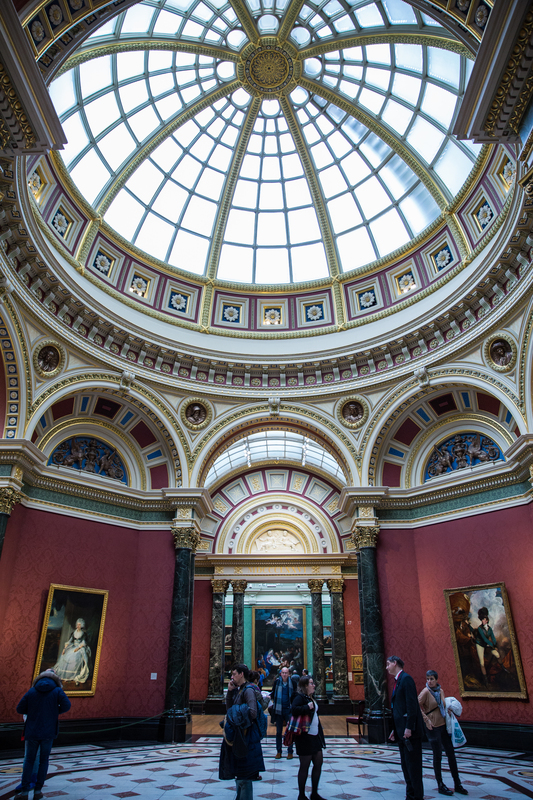 Three Free Museums to Visit in London; A Perfect Rainy Day Idea. 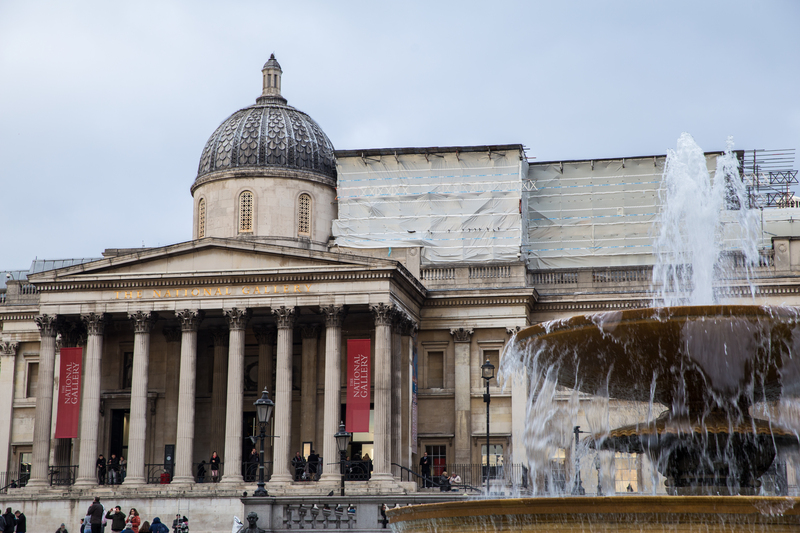 London has no shortage of museums to visit; The Tate Modern, Natural History Museum, British Museum, National Gallery, National Portrait Gallery, Victoria and Albert Museum, Imperial Warm Museum, Science Museum, National Maritime Museum, to name a few. It can be quite overwhelming trying to decide which ones to see, especially if you are in town on a shorter trip! However, the wonderful thing about most of the museums is that they are publicly funded, and therefore have free admission! This makes visiting any of them a good choice, especially if you are on a budget, or need somewhere to pop into if it starts to rain. 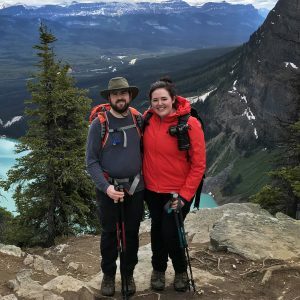 During our last trip this past December, Brian and I had a chance to visit three wonderful museums in the city. While we did not have time to dig into any of them extensively, it was still fun to escape the cold and explore their contents. 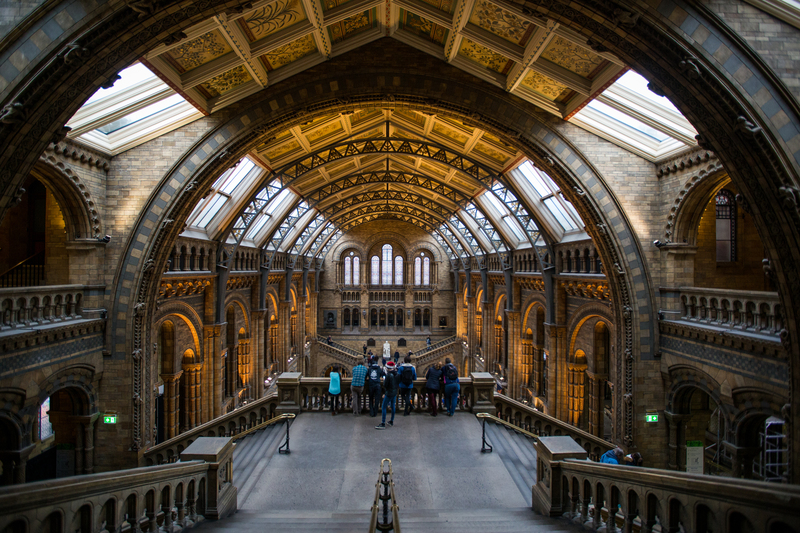 We decided to go to the Natural History Museum first to admire its beautiful Victorian architecture. The main hall of the building is absolutely stunning! 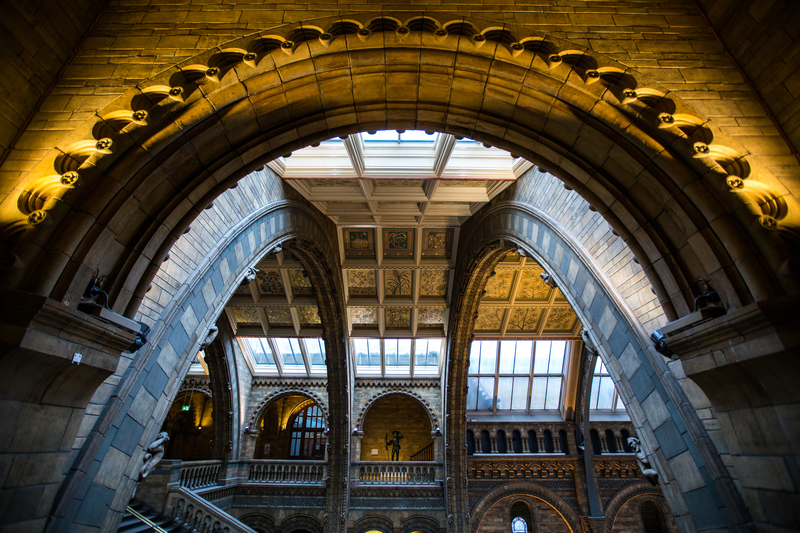 Just inside the doors we were lucky to view a 105-foot-long replica of a Diplodocus Carnegii skeleton, nicknamed “Dippy”. Shortly after our visit, the skeleton was replaced by a blue whale skeleton, and Dippy was sent to go on tour. 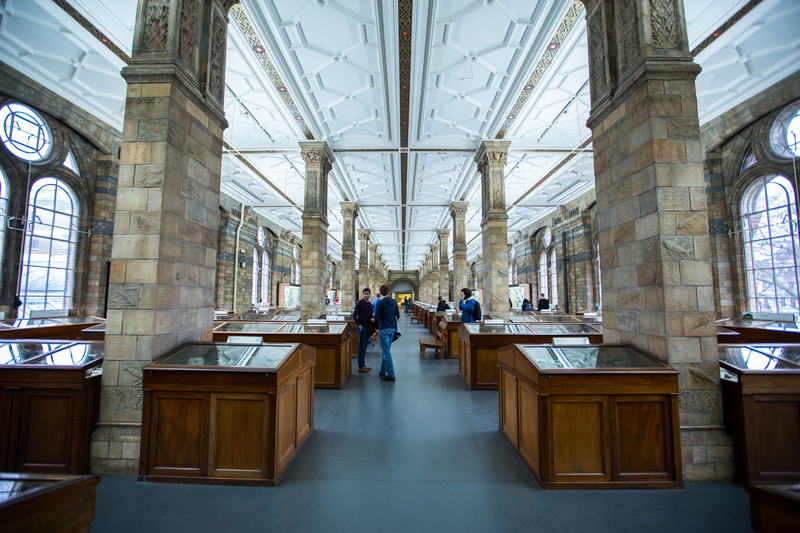 Surrounding the main hall, there are a range of exhibits which are dedicated to specimens from botany, zoology, entomology, mineralogy, and paleontology. It was interesting and enjoyable to walk around and admire all of the things that are a part of our world’s natural history. There are also exhibits in the second story of the museum, and if you are willing to climb a few sets of stairs, you can take in alternate views of the stunning great hall. 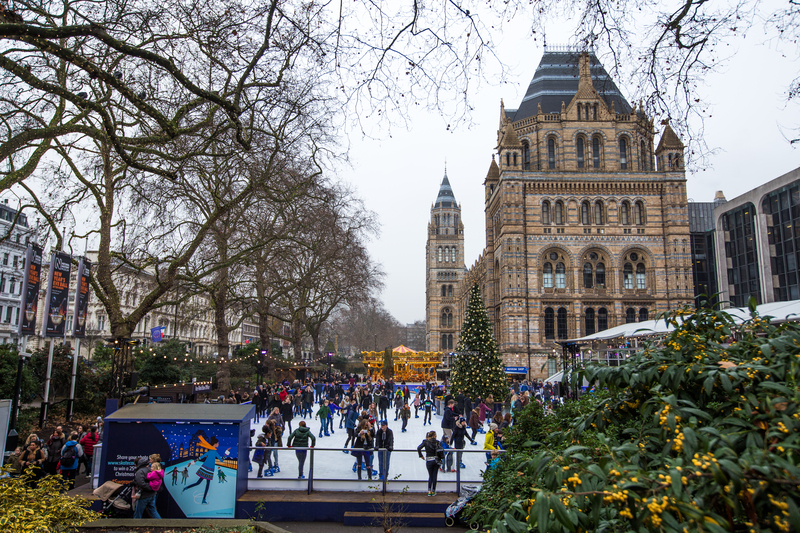 The Victoria and Albert Museum can be found just down the street from the Museum of Natural History. 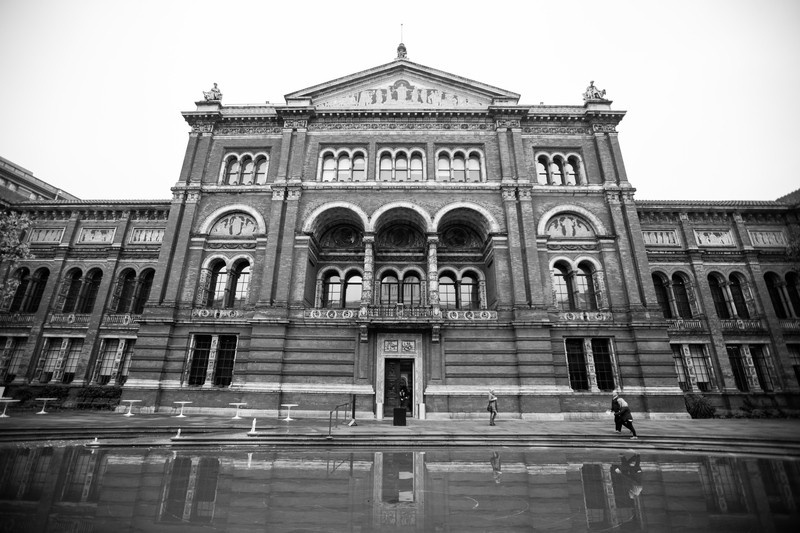 It is the world’s largest museum of decorative arts and design from ancient cultures to the present day. 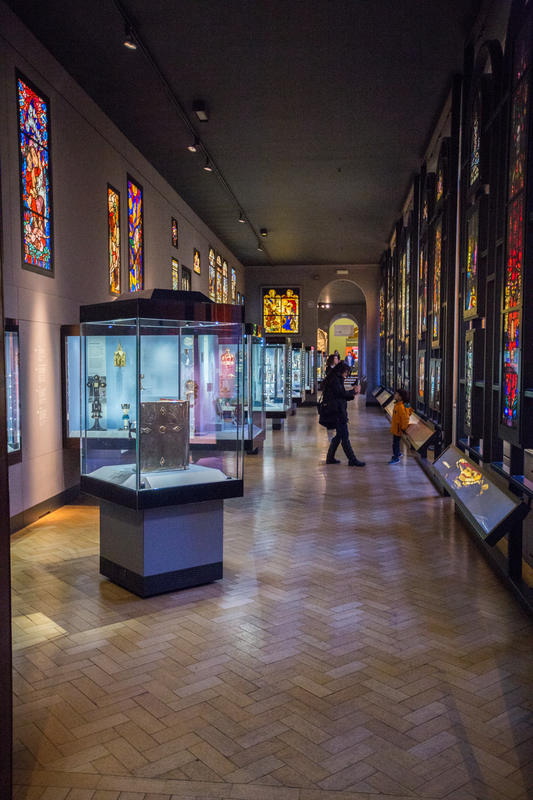 The collection departments include: Asia, Furniture, Textiles and Fashion, Sculpture, Metalwork, Ceramics & Glass, and Word & Image. 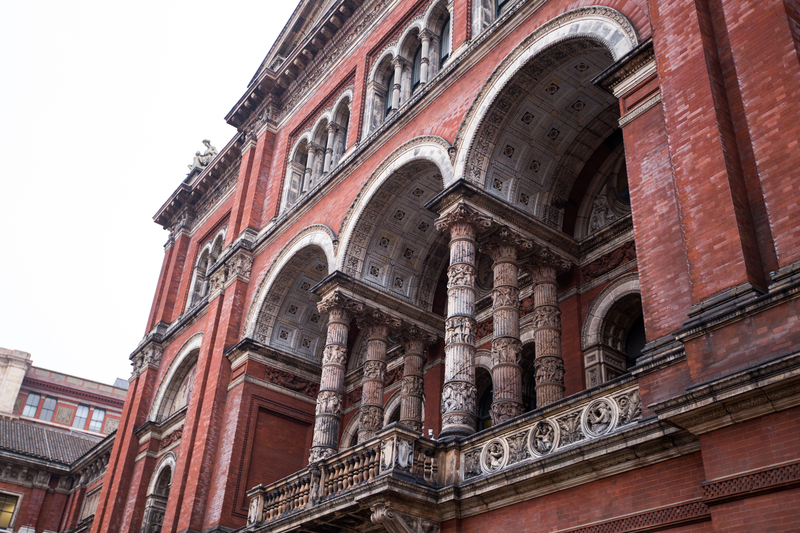 Brian and I really enjoyed walking around the Victoria and Albert Museum because there is such a variety of art. Some of our favorite displays were the Textiles and Fashion and the Sculpture. 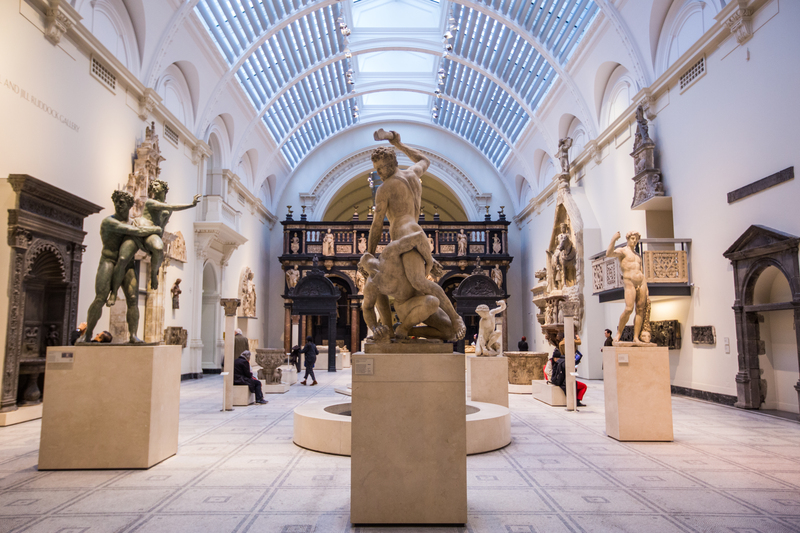 In fact, the museum has the world’s largest collection of post-classical sculpture! 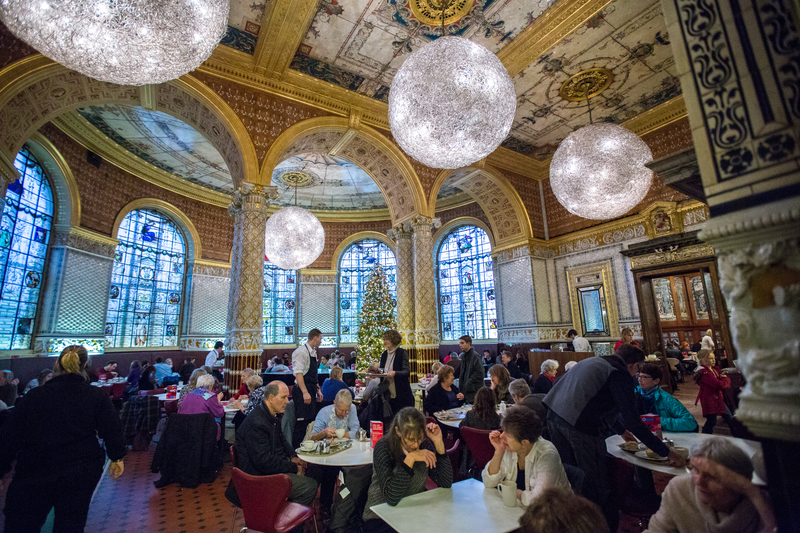 If you work up an appetite while visiting the Victoria and Albert museum, there is a beautiful cafe located in its center. They serve a variety of snacks, and you can also enjoy a traditional British tea here! 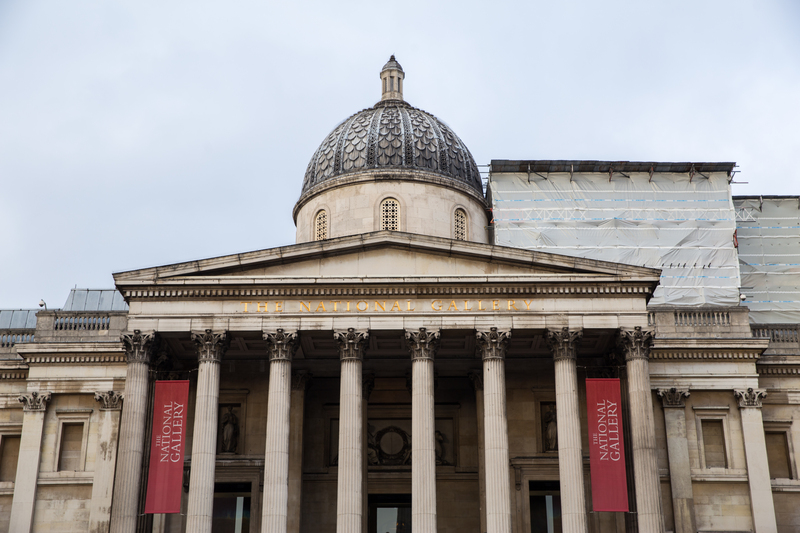 The National Gallery is an art museum located in Traflagar Square. The museum houses a collection of paintings that date between the 13th-18th centuries. 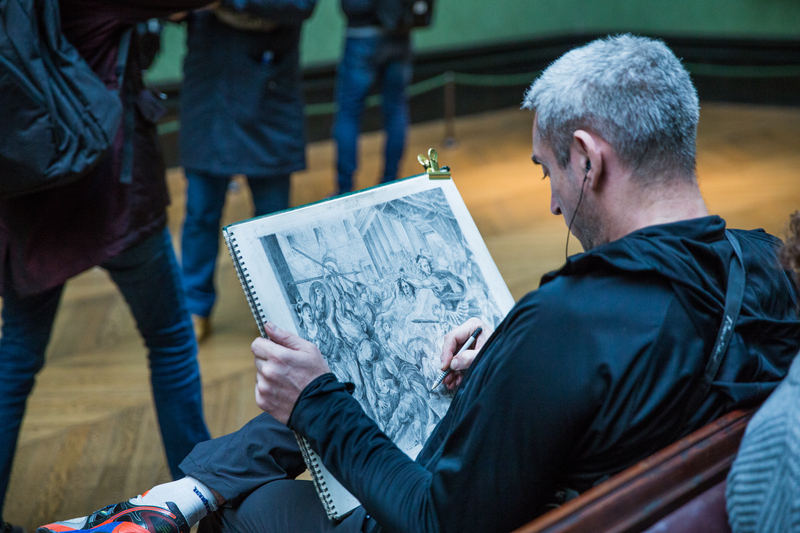 Some of the famous works that call this museum home include The Virgin of the Rocks, by Da Vinci, The Fighting Temeraire, by J. M. W. Turner, and Sunflowers by Van Gogh. 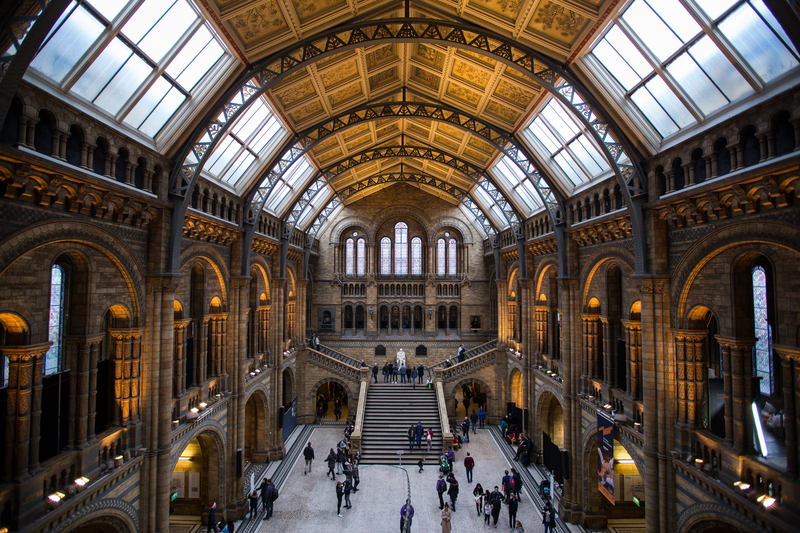 Similar to the Museum of Natural History, the National Gallery’s architecture is stunning. The main building boasts dome ceilings, dark marble door casings, mosaics and rich ornamentation. 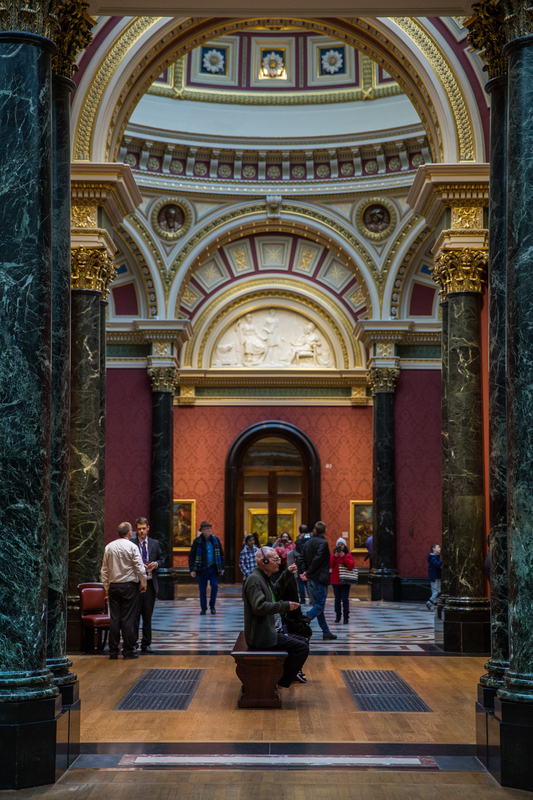 Whether it be a painting or piece of architecture, there is something to see in every corner of the museum. 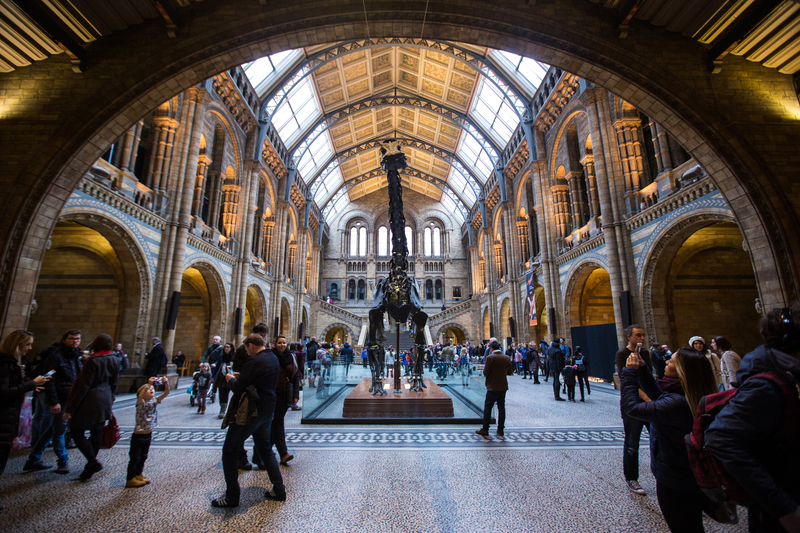 There are definitely many, many more museums worth visiting in London. These just happened the be the three we chose to experience on this trip. 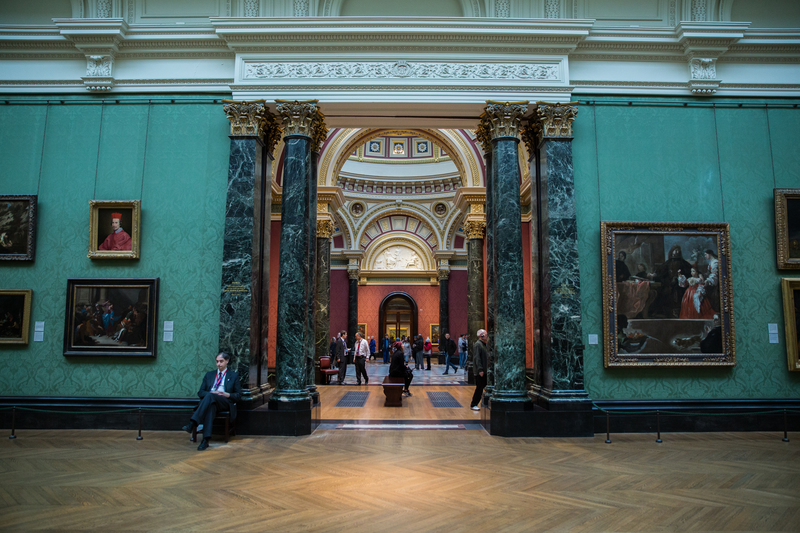 Have you visited any museums in London? Let us know what you recommend in the comments below. I love the national history museum, always try and pop by when I have a full free day during the week! Love that its free entry!